They are into Gimme Shelter. I am getting goosebumps. I just realize this is the day. They have not played "Silver Train" yet, but there is no way I could replace one single song they have been performing yet with any other song. Which means I am about to experience the perfect show - for me! I am all a big smile. The crowd has been great ever since they started queuing for merchandise this morning. Mick has been consuming their energy from start. Keith has been constantly in front of Charlie song by song now. Keith is just stepping forward when he has got something important to say - through his guitar. And again and again, he is there with his angry smile, belting out his famous riffs. Some times with a false start like on IORR, but it is part of the show and I would not even bother, he is on track within the next riff, and the band is so tight tonight. It is these rare moments when Mick just go into a higher energy level. Like on "Brown Sugar", a song many people just read from the set list and say "boooring"... So sad. Tonight "Brown Sugar" is on fire. The crowd is singing. Mick is running. Keith is riffing. Ronnie and Charlie doing their job. The band are on and the crowd are on. Mick is just returning from the long walk out into the center of the venue. Then he is running over to the far Keith side on our right. Then he just decide this is it - he start speed running in what I would say is like a real sprint all through the center and way over to the other side of the Tokyo Dome. The rest of the band stand still thank God. At that speed accidents may happen if he bumps into somebody. Energy! But the crowd loves it. Mick is close to everyone tonight! Midnight Rambler is a dream come through. 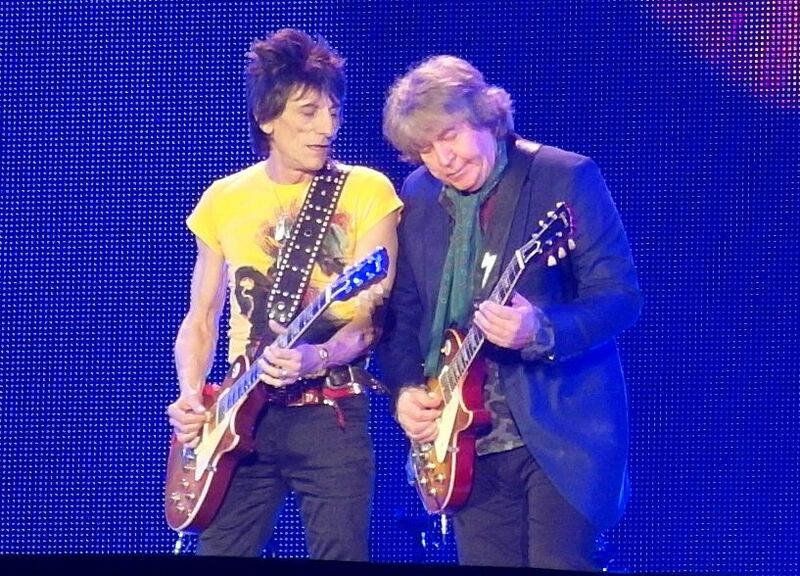 Mick Taylor had just warmed up with Keith on "Slipping Away". Standing discretely next to Darryl. 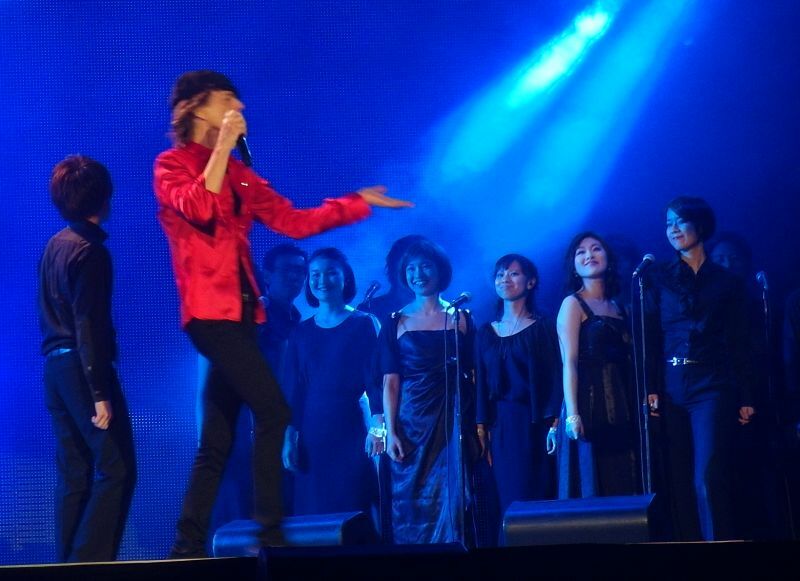 But now he is owning the stage with his other friend Mick Jagger. They are over to the Ronnie side. Mick Jagger tease Mick Taylor and Taylor answer through the guitar. The song is like forever and I enjoy every second, every minute, Rambler is may be the highlight of many shows, but tonight every song is the highlight indeed. Lisa is walking to the center stage during "Gimme Shelter". The crowd is roaring. 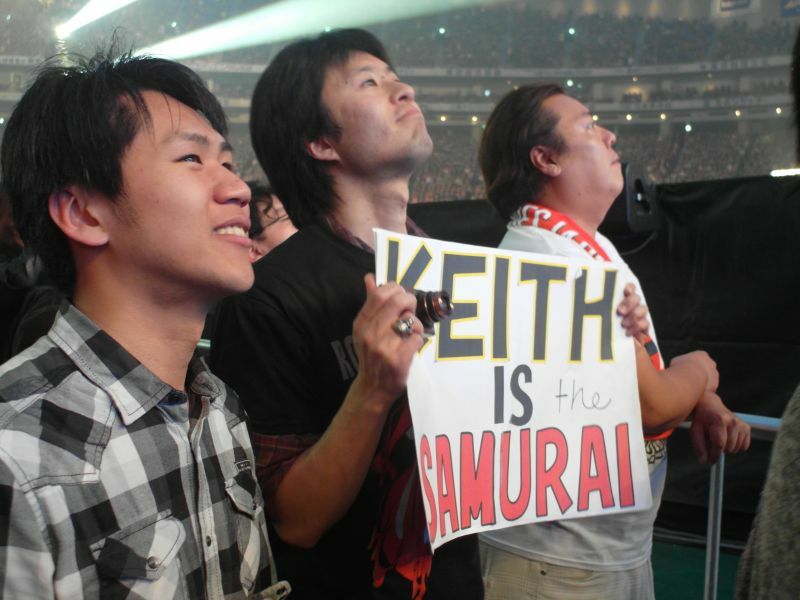 Signs of "Go Ronnie", "Keith is the Samurai" and plenty others are up in the air. luckily cameras are not allowed so we can see the bank and not thousands of hands doing youtube videos. Mick is soon down there with Lisa. Then Lisa is back, she is sneaking in like a cat, all over Keith, as usual at that moment in the song, but right then Keith is Keith and he is all so concentrated on playing his best part of the song. He is giving Lisa a quick smile but then he is back into deep concentration playing his riffs. I am impressed. The man in me would loose tyrack if Lisa was crawling all over me, I am sure, but Keith is here for us. And I think Lisa knows it. She is moving on through the stage towards Bernard. I am not going to write up a long report. It is long already. I just wanted to tell everybody that tonight they did the best show I have seen in a very long time. Thanks to the crowd, great great crowd, thanks to Mick, who picked up all the energy from the crowd, thanks to Keith, for standing in front of Charlie and performing one of the best guitar riffs I have got in years from the Stones, and thanks to the rest of the band for making a great evening come through. 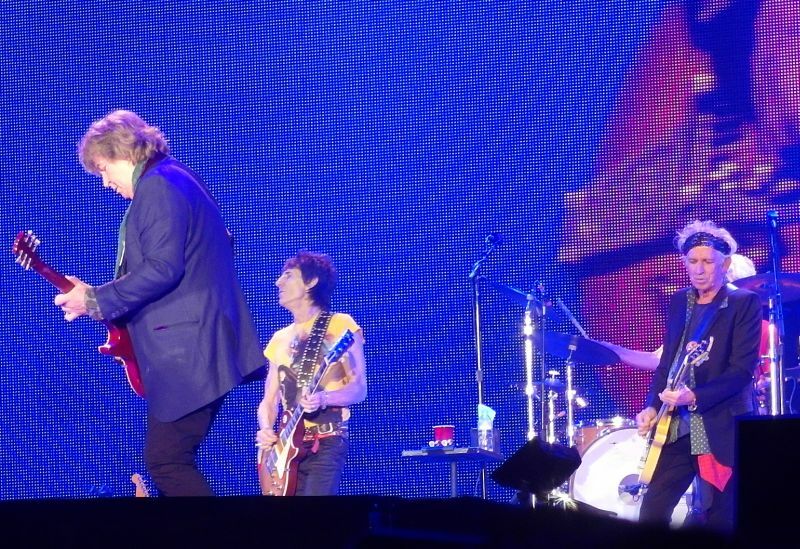 Mick Taylor appeared next to Keith again. He had played 2 songs before with Keith's song. Mick got ready harmonica and sounded some phrase. That's a sign of "Midnight Rambler" and started one of highlight in this night. They are back to Japan since 2006. The members are aged but never mind it. Japanese fan always wait their show. And the time has come! Dreamy 3 days has began from this day. 7PM, patience broke by impressive riff, "Get Off of My Cloud". Shout filled baseball stadium with joyful sound. I was surprised that they played "Honky Tonk Women" on 8th track, it seemed a little bit early to appear on setlist. Keith has been not good condition at first, but he recovered it from this song. "Midnight Rambler" was truly highlight in this night. Taylor's solo was so crazy and brilliant! Mick stirred his play up with harmonica. Felt I was in dream. Magnificent night! That what I say! Mick’s Soul Touched the Audience Did they go through a soundcheck? Did they rehearse for the show? Everything seemed to be on the precarious balance. Mick's outstanding performance saved the show. And, perhaps Charlie's rock solid drums. Don't get me wrong! I'm not complaining. I enjoyed the concert. So did my daughter, who accompanied me instead of her mother in heaven. I even found myself crying. I saw a lot of women around me in tears, too. This imminent feeling that the things might go wrong at any moment was a great part of the enjoyment. The Stones are not Paul McCartney. They play rough, ragged rock'n roll! My daughter and I are attending two more concerts at the Tokyo Dome. See you in Block A-11! 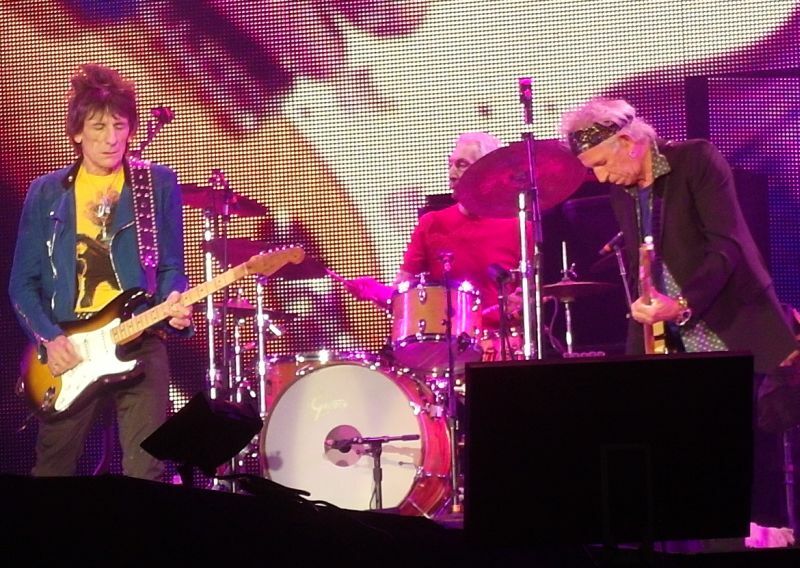 I attended the Stones’ first Tokyo concert last night, February 26. 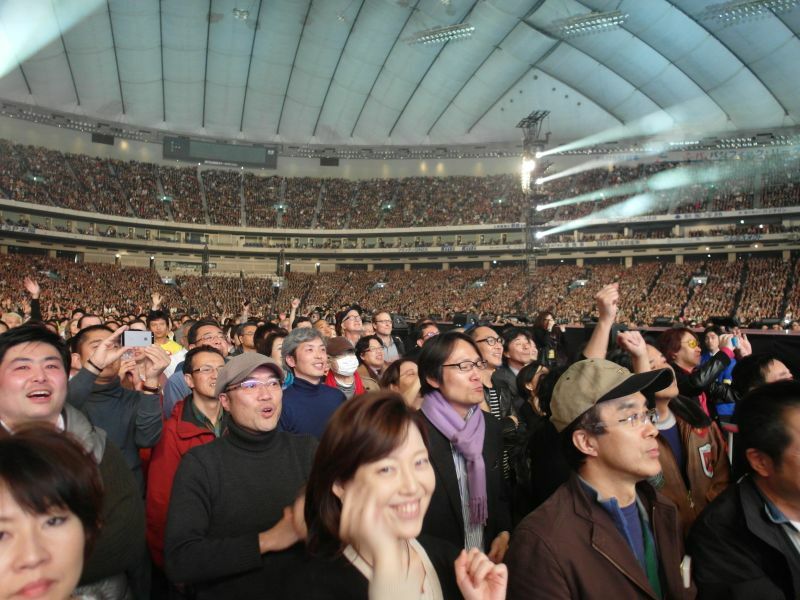 Although the cavernous and acoustical-unfriendly Tokyo Dome is hardly the most-ideal venue, the sold-out concert was nonetheless very enjoyable and well performed in front of an extremely appreciative audience. 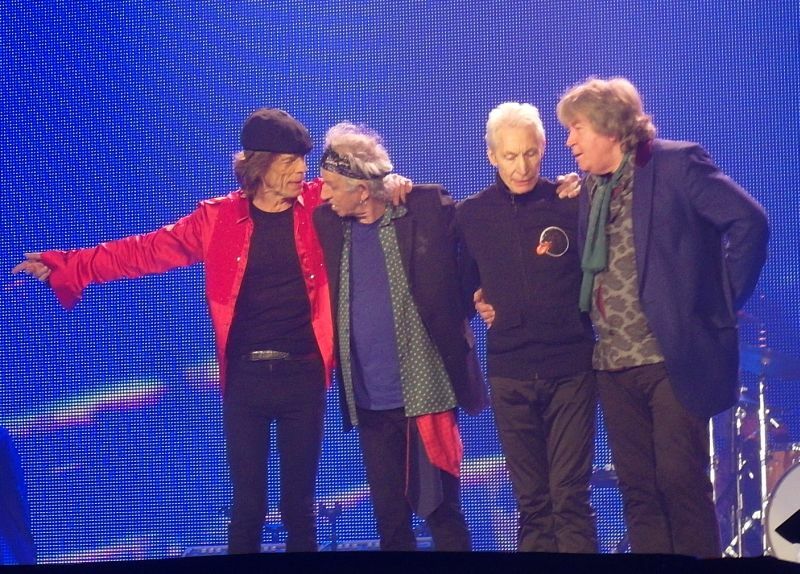 In many respects, the Stones are better now than when I first saw them perform at the Los Angeles Forum in 1972. 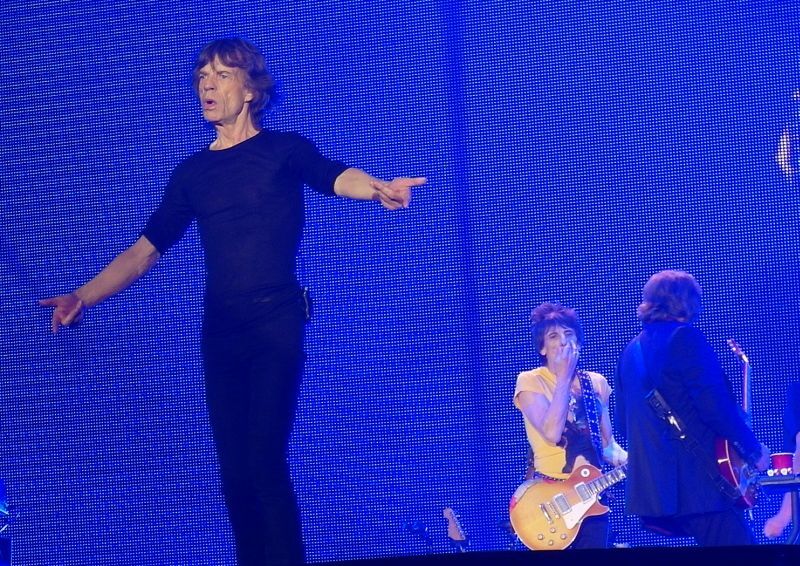 The Stones opened with Get Off My Cloud, which sounded a bit retrained, followed by It’s Only Rock N Roll. They continued with such classics as Tumbling Dice, Honky Tonk Woman, and Wild Horses. Keith’s renditions of Before They Make Me Run and Slipping Away were somewhat flat and left a bit to be desired in my opinion. I would not be surprised to see one of these numbers replaced later during the tour. 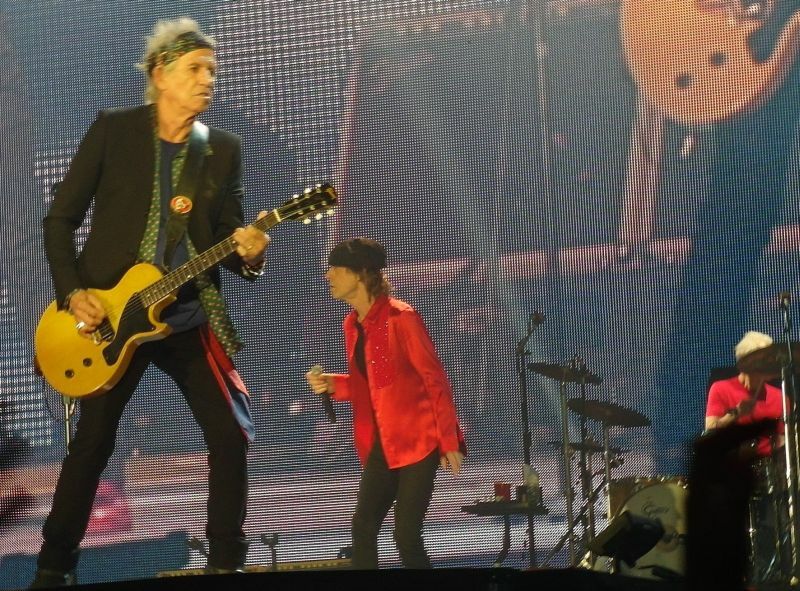 The Stones kicked into high gear in the latter half with such staples as Midnight Rambler, Gimme Shelter, Paint it Black and Brown Sugar. 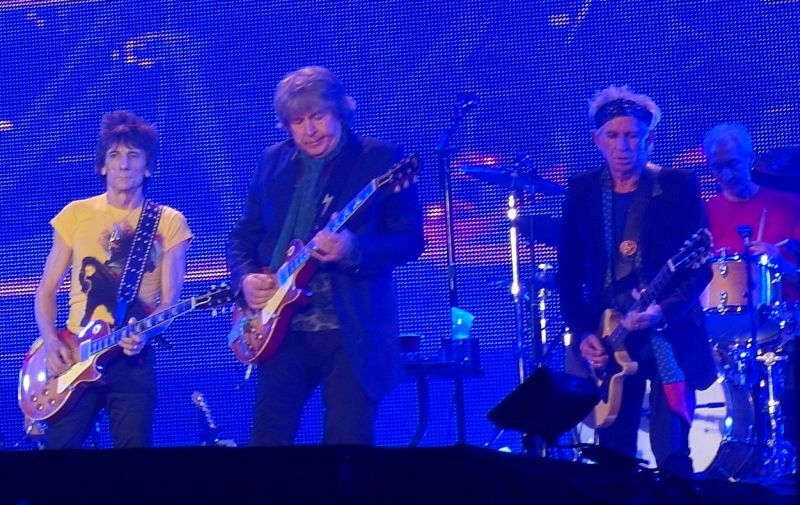 Mick Taylor and Jagger were excellent on Midnight Rambler and Lisa Fischer electrified the crowd with her scorching vocals on Gimme Shelter. The show predictably closed with You Can’t Always Get What You Want, featuring a local choir, and Satisfaction. Ronnie Woods played energetically and the ever-consistent Charley Watts was on top of his game as usual. Bobby Keys and Chuck Leavell provided spirited performances on sax and keyboard, respectively, although at times they seemed to drown out the guitar playing of Woods and Richards, at least from where I was sitting. All in all, it was an excellent concert amid a buoyant atmosphere. This is my first report on IORR since March 2006 when I reviewed both the Tokyo-1 and Tokyo-2 shows, and also Saitama. I certainly hope this is not my last review.